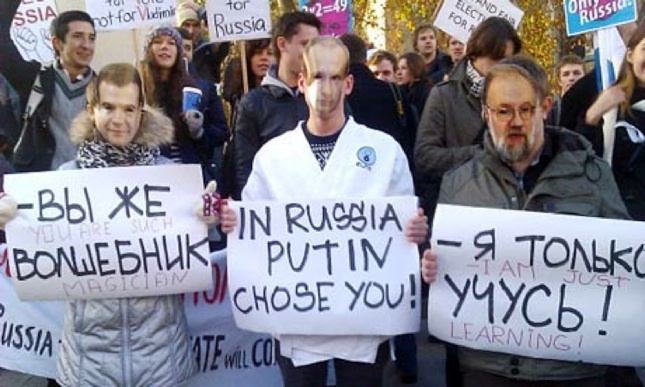 Russia’s widespread popular protests against Vladimir Putin and his United Russia party, following the disputed parliamentary elections in December 2011, have rightly grabbed international attention. 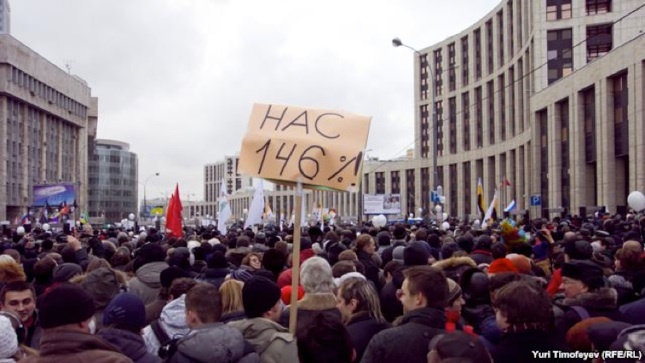 As many as 50,000 protestors gathered in Moscow to demand a re-run of the disputed elections. Throughout 2012 Western commentators had been predicting a landslide victory for United Russia and were confident that one of two scenarios would play out in the Presidential elections of March 2012. Either a smooth transfer of presidential power from Dmitry Medvedev to Vladimir Putin would take place allowing the later to serve at least one six year term with the possibility of re-election in 2018, or Medvedev would remain in power to dispel the widely held view that he was simply a stop-gap President lending greater legitimacy to Putin’s return in 2018. Yet the recent protests have suggested it might not be as easy as Putin and United Russia think. The announcement in November 2011 that Putin would run as United Russia’s candidate was a clear indication of the extent to which Russia’s political elite refuse to acknowledge the so-called ‘will of the people’. Cronyism is endemic in Russian politics and allegations of government fraud are widespread. Wikileaks document released in 2010, for example, estimated Putin’s personal wealth at almost $40 billion but Russian election officials dismissed this figure in 2011 confirming the official figure to be only $180,000. This seems unlikely. Ultimately, public perceptions of corruption have served to chip away at the popularity of Putin’s government and as recent parliamentary elections have shown, United Russia’s share of the popular vote has decreased from 64% in 2007 to just under 50% in 2011. Many believe that excessive vote rigging served to hide the true extent of peoples’ disenfranchisement. Putin’s personal approval rating has also dropped significantly from 88% in September 2008 to 67% in November 2011. The fact that it has failed to drop further is primarily due to the lack of a credible presidential alternative. Individuals such as Alexander Navalny, a 35 year-old anti-corruption fighter who emerged as the leader of the post-2011 election protests, or Mikhail Prokhorov, a Russian billionaire entrepreneur who recently founded the opposition Right-Cause party, lack the strong-man character that Russian voters’ seem to love. The international community must play a role in addressing this ongoing problem. Firstly, the Organisation for Security and Co-operation in Europe (OSCE) must seek to ensure that the presidential elections in 2012 conform to international democratic standards and in doing so must highlight cases of vote rigging. In addition, Western leaders must be quick to acknowledge how their public statements may be manipulated by the Russian government. The Russian public on the whole distrusts the intentions of Western leaders, and grandiose statements or criticisms of events taking place in Russia are interpreted as yet another attempt by the West to impose its views and values onto other countries. Thus, Hilary Clinton’s misguided decision to publically call for an investigation into allegations of election fraud in November, although perhaps designed as a play to anti-Russian opinion within the US, was nonetheless used by Putin to blame America for inciting Russia’s recent domestic unrest. By doing so he deflected attention away from the deficiencies of his own government. If allegations of election fraud do emerge in March 2012, and one must suspect this will be the case, Western leaders must raise concerns both publically and privately without making comment on Russia’s internal institutions or election processes. Secondly, Western leaders must privately use their diplomatic weight to pressure Putin and Medvedev into ensuring opposition politicians are provided with the media access required to mount a credible election campaign. As has been widely reported the contemporary Russian media landscape is led by three conglomerates: The Russian Federation Broadcasting Company (VGTRK), a state-run organisation, Gazprom-media, a public-private joint venture, and Prof-Media which is a purely commercial organisation. The result is that the majority of media sources within Russia are either directly or indirectly controlled by governmental or government-controlled structures; hence media coverage prior to elections is heavily pro-government i.e. pro-Putin. In fact, in 2008, Russia was ranked 170th in the Global Press Freedom Rankings, alongside Sudan, Yemen and Kazakhstan. Interestingly, Russia’s recent accession to the WTO might precipitate the growth of alternative media sources. But for the time being countries such as the US, the UK, Germany and France must urge Putin to play fair. Finally, Western leaders must ignore the temptation to lend support to opposition candidates as this will only serve to deligitimise them in the eyes of the Russian public. Such a step would represent a significant faux-pas providing Putin with the ammunition required to label his opponents as Western stooges. The ultimate aim of Western governments should not be to influence any form of regime change. In reality, the Russian public may decide Putin still represents the figure they wish to lead their country. However, such a decision should be the result of fair, legitimate and democratic elections. This should be what the West desires. Ultimately though, it must be the Russian public that facilitates a radical change in how their country is governed. Interestingly enough such a scenario is not as unlikely as it may have seemed only six months earlier. 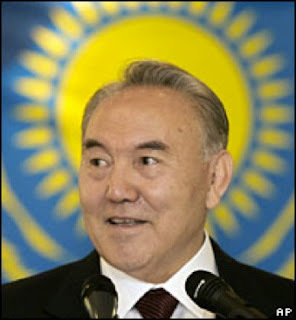 For the last 20 years one man has ruled Kazakhstan, president Nursultan Nazarbayev. The statistics alone tell us a story. In 1991, following independence from the Soviet Union Nazarbayev won an uncontested election. In the first contested poll in 1999 he garnered 81% of the vote to win, a feat which he has repeated in every election since. In the most recent presidential race in April 2011, Nazabarayev was once again victorious, this time with a 95% majority. These figures clearly illustrate that the Kazakh electoral process leaves a lot to be desired in terms of free and democratic standards, especially when considering the large size of the population involved (16.5 million) and its ethnic diversity. Such suspicions of electoral irregularities have been confirmed on a number of occasions by various observers including the Organisation for Co-operation and Security in Europe (OSCE) and Transparency International. Once again, on January 15th, Nazarbayev’s Nur Otan party won an 80% majority in parliamentary elections, however, this is not the biggest development to come from Kazakhstan in recent months. Rather, the most surprising event has been the – albeit isolated – development of popular opposition to the current status quo, coupled with a change of rhetoric by Nazarbayev towards a more inclusive political landscape. 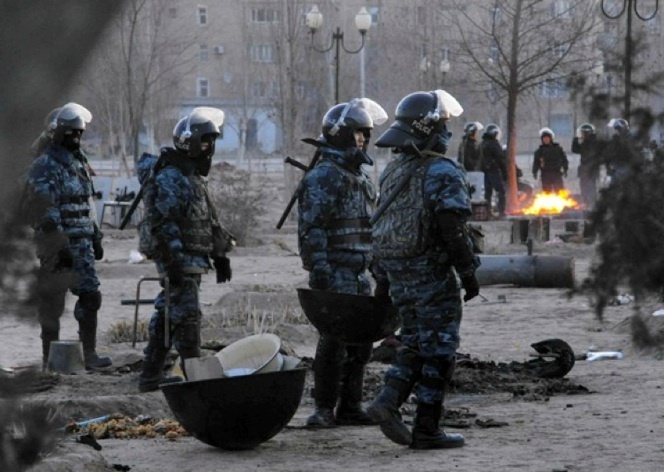 In late December a large wave of popular discontent broke out in the Mangistau region, specifically in the oil-producing town Zhanaozen. The unrest lasted for several days resulting in 16 deaths and hundreds of injuries. The government took swift measures to restore order, including calling a state of emergency, the suspension of the parliamentary elections in the city, the imposition of a curfew and the disconnection of mobile and telephone services. When one takes into account the fact that strikes have hampered the town and its oil production since May of 2011, it becomes clear that there is a simmering discontent amongst the Kazakh population, even if its expression has so far been limited geographically. These small examples of dissatisfaction are perhaps the reason why Nazarbayev has opted to take a more conciliatory approach to the situation since calm was restored. Despite officially suspending the inclusion of Zhanaozen in the parliamentary election, he backtracked, and allowed full participation of the city’s residents in the January 15th polls, citing his desire to give the city’s inhabitants ‘the opportunity to exercise their constitutional right to elect and be elected to the state and local authorities’. He has also expressed willingness for the Kazakh state to slowly move towards a more open, multi-party system of governance. The reasons behind this approach seem to be two fold. Firstly, the strikes have affected the region’s oil production with KMG – the state oil producer – expecting an 8.5% drop in output. While a profit drop was avoided thanks to the high prices of crude oil, the drop in production proves the potential for disruption which is caused by social unrest, particularly as the Kazakh economy mainly relies on the oil and mineral industries. This combined with the fact the 2008 global economic crisis deeply affected the Kazakh state, largely due to the drop in oil prices, suggests that Nazarbayev realizes the importance of keeping the workers of Kazakhstan’s main industry happy for the country’s financial outlook. Secondly, following a year where countless authoritarian governments have tumbled as the Arab Spring spread across a number of regions it is clear that governments have to show a willingness to adapt. For Kazakhstan this is particularly important as it seeks to maintain positive engagement with the West, which represents an important source of investment money. In 2010 for example foreign direct investments in Kazakhstan amounted to US$9.9billion. For the UK, this is good news. Its exports to Kazakhstan in 2010 were worth US$315 million and its imports US$300 million. Arguably, Nazarbayev’s rule has generally provided the required political stability whilst being very open to foreign investment and promoting legislation and reforms aimed at further encouraging investment. However, events of the last twelve months in North Africa and the Arab world undoubtedly prove the need for the Kazakh regime to adapt to the current climate and to liberalize, rather than relying on its authoritarian hold on power. A positive sign in terms of the UK’s interests has been the regime’s willingness to directly engage the UK, as well as other Western states, in its reform process. It has been announced that President Nazarbayev is now receiving advice from former British Prime Minister Tony Blair, whilst also considering taking on other western advisers. While it is difficult to look at this appointment without ignoring the reportedly large payments involved, as well as Blair’s blotchy record in advising foreign rulers such as Muammar Qaddafi, it is very much a step in the right direction. The challenge now, for both Nazarbayev and the UK will be to build on these small steps and pro-actively work towards securing real commitment from Kazakhstan towards the development of a more open and democratic state. UK involvement in this would allow for Nazarbayev to prove that his willingness to adapt is real, whilst also helping him to ensure the financial, political and social stability of his country. Obviously all this would require time and patience but the potential rewards for the UK in the long-term would be worth it. If reforms were to progress thanks to UK engagement and Kazakhstan were to move towards a more open and multiparty system of governance, this would mean the UK could have a strong presence in what is a tremendously important region, due to its immense resources and its proximity to powers like Russia and China. In the short-term, engagement will provide reassurances for UK investors and opportunities for the UK government to explore whether Nazarbayev is actually serious about implementing reforms. Only time will show whether Nazarbayev’s commitment to change is serious and currently it is difficult to view his rhetoric as little more than a democratic facade. While the new parliament boasts the inclusion of three parties, Nazarbayev’s Nur Otan still holds an overwhelming majority, and in Zhanaozen a state of emergency remains. Despite this, the combination of the current world-wide political and financial climate suggests that now is a good time for UK-Kazakh relations to progress. What is now required, is a commitment from Nazabayev to implement changes and willingness from the UK to commit to engagement with Kazakhstan in the long-term. Future Foreign Policy. Powered by Blogger.